Our Bed & Breakfast is located in Enfield, NH, in the Upper Valley of New Hampshire and Vermont, off routes 91 and 89. Our modern, log home was built in 2002 on Crystal Lake and has a private lake dock. We live on site and are open year round. We are close to Dartmouth College, Cardigan Mountain School, KUA, Cardigan State Park, St. Gaudens National Historic Site, Shaker Museum, and LaSalette Shrine. Our quiet setting on 20 acres is home to all kinds of wildlife. You may see white tailed deer, red fox, wild turkey, loons, blue heron, even a bald eagle! Enjoy an evening campfire. See if you can identify the constellations. Swimming, boating, fishing, hiking, bicycling and the Northern Rail Trail are all nearby. 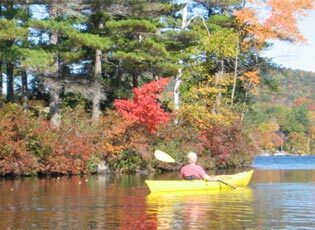 Enjoy New England's fall foliage, antiquing and covered bridges. In winter, cross country ski and snowshoe. Three rooms with comfortable queen or king size beds and cozy down quilts when needed. There is a small refrigerator in each room, as well as hardwood floors, ceiling fans and an air conditioner. Baths are private and include an amenity basket. Our rooms have country decor and views of the meadow and woodlands. Free WiFi. Please contact us about early or late arrivals and any special requests. We serve a full country-style breakfast which may include fresh fruit and vegetables in season, individual egg quiche cups, ham, bacon or sausage, family-made maple syrup, and Aunt Verna's blueberry muffins (made with locally picked blueberries, some from our own bushes.) Coffee, teas, hot chocolate, fruit juices are available. Breakfast is served in the dining room or outside deck, overlooking the lake and mountains at a time that works for your schedule. We can accommodate your dietary needs if you let us know in advance.